A desire for country living trumps economic factors when it comes to starting businesses in rural Indiana. That's a key finding from an Indiana State University survey that researchers say highlights the importance of entrepreneurial development in small towns and rural areas. The survey found economic factors important to sustaining and expanding businesses in rural areas, but most respondents started or purchased their business because of a strong desire to live in a rural area and to own a business where they live. "Many respondents were likely to have spent some time away, but a sense of place would often draw them back to their hometowns," said Steven Pontius, professor of earth and environmental systems and director of Indiana State's Rural-Urban Entrepreneurship Development Institute (RUEDI), which commissioned the survey. "These findings underscore the need for entrepreneurial or leadership development programs that connect elementary and secondary students with business opportunities in the community to help to develop that sense of place at an early age that sticks with students as they go off to college." Indiana State's Survey Research Lab invited more than 10,000 small business owner/operators in rural areas and small towns across Indiana, including those in farming and agribusiness, to participate in the online survey which included respondents from 84 of Indiana's 92 counties. The survey showed that those involved in agri-business experience similar concerns as those involved in other industries. Those concerns include obtaining financing, combating rising healthcare costs, increasing market share, providing for technological support and training employees. According to the survey, the average rural business owner is a middle-aged, white male with a college degree and 17 years of experience in his chosen industry. The average entrepreneur has owned his own business for approximately 12 years. There were little differences between the characteristics of agriculture-related business owners or farmers and those in non-agricultural industries such as service or manufacturing. However, those in agriculture tended to be more than a decade younger, with an average age of 38 compared to non-agriculture business owners with an average age of 51. Two-thirds of respondents indicated they had a college degree or higher including associate degrees or multiple under-graduate degrees. About 90 percent of respondents represented a non-agriculture industry with two-thirds of those operating within the service sector, followed by retail (17 percent) and manufacturing (12 percent). Four times as many agri-business owners were likely to be following a family tradition as compared with those in other industries. Respondents from both non-agriculture and agriculture businesses indicated that their individual enterprise employed fewer than 50 people with 78-percent reporting fewer than 10 employees. Future plans for respondents, regardless of industry sector, demonstrated an overwhelming desire to expand their current operations within the next three years. While the characteristics of entrepreneurs in rural agricultural and non-agricultural businesses vary little and they face similar challenges, their attitudes differ toward three key issues of concern to rural communities, Pontius noted. While more than 86 percent of non-agricultural respondents ranked new business development either very important or a critical concern, only about 57 percent of agri-businesses did so. The two groups were also divided on the importance of maintaining population, by a margin of 78.5 percent to 54.1 percent. Both groups were more closely aligned on the importance of finding civic leaders, with about three-fourths of those responding considering it to be very important or critical. "These attitudinal differences relate to the central role of land, an immovable resource that is critical to the expansion of agricultural businesses," Pontius said. "The attraction of new industries and construction of housing developments for a growing population often result in the loss of prime farm or pasture land restricting farmers and ranchers' ability to expand their own operations. Programs that emphasize redevelopment of under-utilized business parks or brownfields, and that support efforts to connect farmers with landowners who wish to sell or lease open land are a win-win for all businesses in a rural community." RUEDI conducted the rural business survey in partnership with the Indiana Chamber Executives Association, Indiana Farm Bureau, Indiana Cooperative Development Center and the Indiana Small Business Development Center. Together the organizations will use the information gathered to develop and provide outreach for programs that emphasize rural entrepreneurial development, Pontius said. 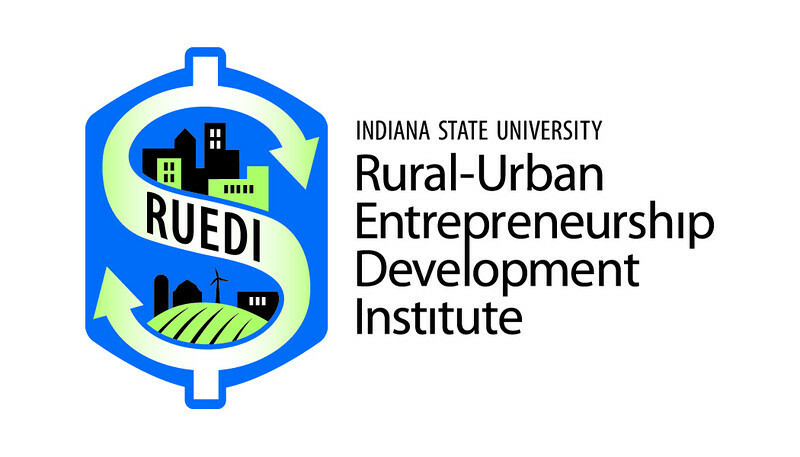 About the Rural Urban-Entrepreneurship Development Institute: Launched in January, 2012, the Rural-Urban Entrepreneurship Development Institute (RUEDI) is an initiative of Indiana State University's Strategic Plan and its Unbound Possibilities program. As part of Indiana State's commitment to strengthen economic development in Indiana's rural counties, RUEDI was created to serve as an engagement, research and learning platform to improve the economic stability of rural areas and small towns through collaboration with local government officials, other educational institutions and business enterprises. Photo: http://isuphoto.smugmug.com/photos/i-jPFMQCx/0/L/i-jPFMQCx-L.jpg - Downtown Huntingburg, Ind., in rural Dubois County. A desire for country living trumps economic factors when it comes to starting businesses in rural Indiana. That's a key finding from an ISU survey that researchers say highlights the importance of entrepreneurial development.